By law, minor party candidates are next: in this case, Libertarian Alexander Snitker followed by Bernie DeCastro of the Constitution Party of Florida. No-party candidates are listed in the order in which they filed their official papers -- not alphabetically. So it's Sue Askeland, Bruce Ray Riggs, Bobbie Bean, Tyler, Crist and Armstrong. In my opinion, all elections should require a randomized ballot to provide for a more equal opportunity on the ballot. Bousquet writes that "a 2005 study of 'ballot order effect' by the California Institute of Technology found 'little systematic evidence' that being listed first helped a candidate" - other studies indicate that the benefit is minimal, especially when party affiliation is listed. A study by the University of Vermont showed that appearing first on the ballot gave candidates a minor edge, with candidates receiving "two-and-half percent more of the vote than those listed after," with even bigger disparities seen "when the party affiliations were not listed, races were minimally publicized, or there was no incumbent running in the election." A similar study conducted on the 24-year history of the California Alphabet Lottery also indicated that being placed first saw a difference of one to three percentage points. Taking into consideration the population of Florida, which hovers around 19 million, a couple percentage points could result in hundreds of thousands of votes going towards the person topping the list. So the ballot will have Crist's name as a different color, larger in size, and with the i's dotted as stars? 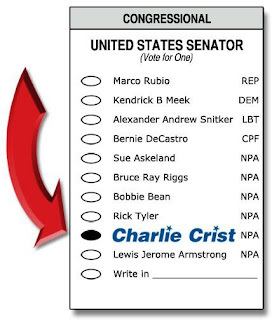 It also looks like the ballot will have Crist pre-selected. How can he lose? That's how my ballot will probably look.